Education is at the heart of our work. 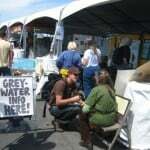 We provide workshops, trainings, presentations, theater, and a demonstration booth on sustainable water use technologies. We offer a variety of presentations, catering to the particular interest and knowledge level of the group. We’ve presented to groups such as colleges, professional firms, garden groups, church groups, high school students, green festivals, and cities. One day installation classes are held in a house. 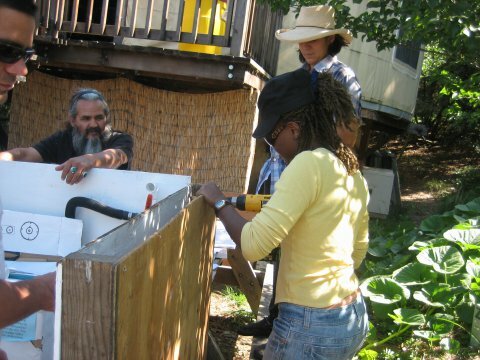 Participants learn about greywater basics through a one hour lecture, and then are led through the design and installation of one type of greywater system (usually a laundry to landscape system). In small groups that rotate, participants learn about the plumbing, the landscaping, and the materials needed for the installation. 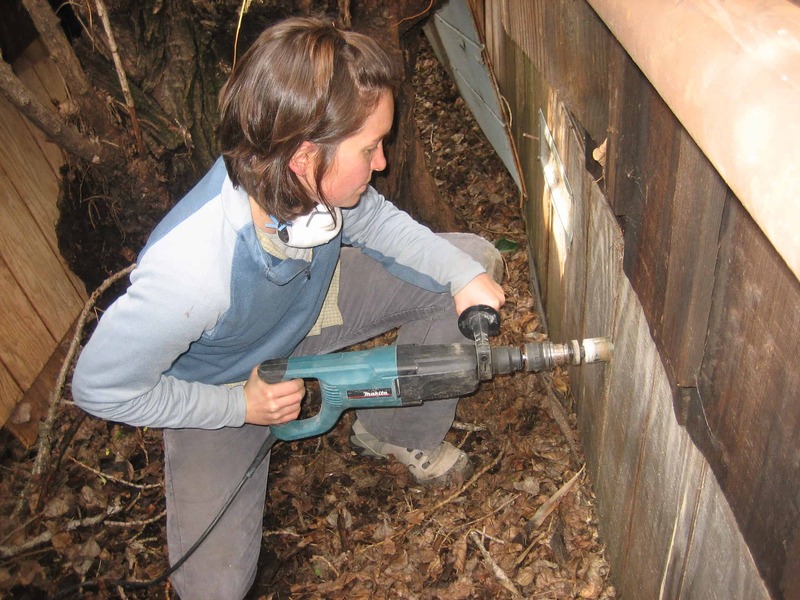 All skill levels are welcome and people who have less hands-on experience are encouraged to practice using tools in a safe, supportive, learning environment. 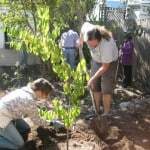 This course covers the basics of greywater. 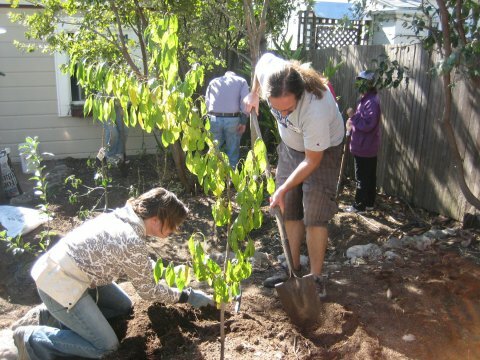 Participants gain experience with the tools and materials required for two types of greywater systems, the laundry to landscape and the branched drain system. 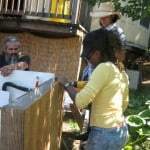 During the course one full greywater system is designed and installed. All skill levels are welcome, and there will be a range of activities appropriate to address the needs of different skill levels. 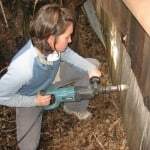 This five day course is designed for people with either basic plumbing, landscaping, or permaculture skills who want to learn how to design and build simple, low-tech residential greywater systems. Participants will study five common greywater systems, discuss how to determine which is appropriate for a given site, and learn about water harvesting earthworks, plant selection, eco-friendly products, and the California greywater code. We are offering an optional exam and the opportunity to conduct an installation. After successfully completing the training, greywater installers can list their contact information on the Greywater Action website, a portal for greywater inquiries from across the country, and join a discussion board with other installers to share information. Learn more and view the week schedule on this page. 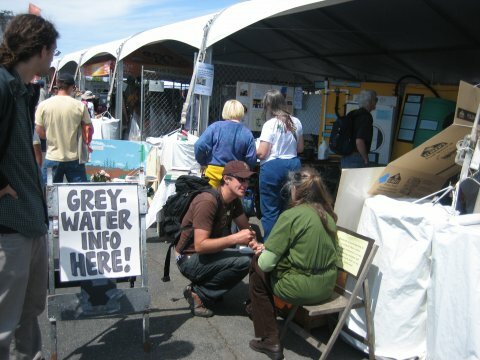 We have a demonstration booth that includes a life-sized model of a greywater system, a portable composting toilet model, and a mini-rainbarrel system. We also have an information booth providing education and resources on sustainable water use for the general public. We and our collaborators developed interactive presentations integrating a visual tour of the water grid, an overview of global grassroots water struggles, and the plays “Take this house and float it away” and “The Gold Fish, or, Straight Flushes for the Manifestly Destined” with facilitated discussions on strategies for action on local and global water issues. We’ve adapted these presentations for universities, conferences, and community forums.